The picture below shows a Swift Connecting Link Loose-Fit Spring. Thousands of other top quality spares listed on our website at refreshingly low prices. 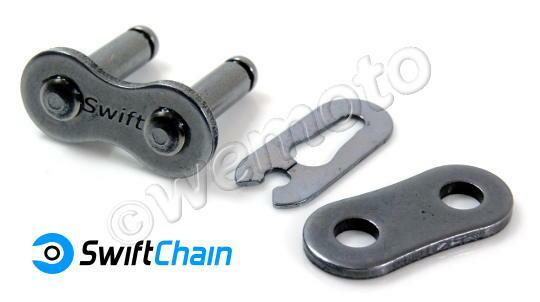 Loose-fit links are the most convenient type of connecting link and can be attached and removed without the need for specialist tools. A loose-fit link has approximately 60% the strength of a regular link in the chain. Upgrading to a press-fit link results in a stronger link (80% of the regular links), but does require tools to be fitted.